Rural Home Cemetery (Big Flats Burial Association) was organized 13 Feb. 1886. It is the largest and only active cemetery (except for the small cemetery at Mt. Saviour Monastery) of seven in the town. It is well maintained by the Association. It is located on the south side and almost adjacent to Route 17/Interstate 86. It is bounded on the east by Hibbard Rd and on the west by the Big Flats Elementary School. The 2000 listing was copied by Town Clerk Teresa Dean and Historian E.R. Van Etten from records courteously loaned by the Association President, Mr. Duane Hills. 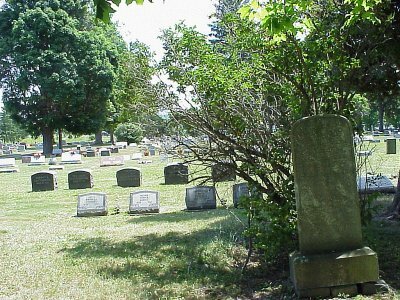 Do You Know that you can search just the search just the 860 pages of Chemung County Cemetery Records on on the site by using the Cemeteries -Chemung button in the Partitioned search engine at the bottom of the Current What's New Page? If you use that partition follow these steps to search just one cemetery. C-D-26-18 Schaddock George E. Mar.31.194?